Calum Chambers has flourished for Fulham recently since being deployed in a midfield role by Claudio Ranieri, the ace on-loan from Arsenal scored a stunner this evening. Claudio Ranieri may have tapped into something that Arsenal have failed to discover about Chambers since his time with the Gunners, the 24-year-old looks much more comfortable in midfield and the Southampton academy graduate will be an important player for Fulham as they look to escape the drop. 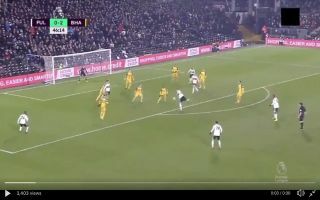 In the 47th minute of Fulham’s 4-2 win over Brighton, the England youth international connected sweet with a half volley that flew into the top corner with the goalkeeper being able to do nothing about it. Chambers showed excellent technique in teeing up the strike perfectly before following through with a thunderous right-footed volley. Why is Chambers scoring goals for Fulham if we badly need a defender? And why is Nelson still in Germany, if we badly need a winger? Unfortunately the chances of the Gunners getting Chambers back are actually extremely unlikely, the January transfer window will slam shut on Thursday evening and the Gunners. To make matters worse Unai Emery’s side have no leg to stand on, as per Mirror Football, the North London outfit don’t have an option to recall the defender turned midfielder. According to a report from BBC Sport last month, the Gunners would have to pay a fee to terminate Chambers’ loan deal and considering we’re so late into the window it’s clear that the club just are willing to do that. Arsenal’s defensive crisis and lack of energy in midfield could be resolved with the recall of Chambers but it looks impossible that the ace will be heading back to the Emirates.